"I hope one day Al-Falluja gets fixed, I just don't see it happening any time soon. I mean, how can it? That's years and years and years of people like us going out there and getting blown up and getting shot at and maybe getting a chance to shoot back." About the only good thing that springs to my mind when it comes to having U.S. troops fighting in Iraq is that the whole "embedded media" element has brought the realities of war home to our living rooms like has never been done in the past. There's in-depth, on-location coverage for every political slant—left, right or otherwise—but no matter what the angle, the dangerous realities of daily life during wartime come shining through in all its sad and depressing ugliness. 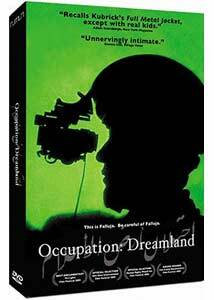 That exposure of an unpleasant reality follows suit with Occupation: Dreamland, in which a pair of filmmakers got very up-close and personal with a squad of soldiers from the 82nd Airborne stationed in the Iraqi city of Falluja in early 2004, just months before the explosive assault in November of that year. Much like Gunner Palace, Scott Garrett and Ian Olds had the equivalent of an all-access pass, and followed the soldiers on raids, on patrol as well as off duty, allowing them to speak their opinionated minds about why they were there, what they were doing, and more importantly, if it was doing any good. Stationed out of a former Bath party stronghold renamed by US forces as Forwarding Operating Base Volturno (aka Dreamland), the soldiers do what soldiers are required to do, and with cameras following them everywhere the level of tension is extremely high. It was a completely nerve wracking experience to just watch, so I can't begin to imagine what being there would be like, and the nighttime raids to "maintain order and suppress resistance" all seem just about to go off into some unexpected and deadly confrontation. The situation in Falluja at the time was particularly unstable and volatile, and the soldiers Garrett and Olds feature as the principle voices here cover the gamut of emotions. Some aren't afraid to speak out about their immense dislike for and indifference towards the Iraqi people, while others reveal more than a glimmer of empathy, wondering aloud how they would feel if foreign soldiers occupied their own home towns, and it's that range of honesty amongst these young men that puts identifiable human faces on the troops, and it captures the hair-trigger dangers with the dramatics of a feature film. Only, it's real. Conservatives may not get the warmest fuzzy glow from this one, though it's hardly a liberal lovefest, either. It is what it is, and more often it seems like a cluster-f**k. The hardball tactics and pitch used to get soldiers to re-enlist isn't met with the warmest reception, but Garrett and Olds do their best to keep their own agendas silent and to let the soldiers do the talking. At the end of the day, this story is theirs. Image Transfer Review: Presented in 1.85:1 nonanamorphic widescreen, Occupation: Dreamland has a doc look to it, and some of the sequences look more rough than others, but those are obviously due to conditions and not a reflection of the transfer. Color quality, likewise, varies, as does the level of detail, depending on lighting, etc. Audio Transfer Review: Considering this is a documentary that was shot under less than favorable conditions, the 5.1 surround mix is something of a thing of beauty. Helicopters swirl and circle around all speakers, explosions are deep and loud, and there is enough directional movement during the frequent gunfire to make some parts of this rival that of a feature film. Voice quality for the interviews is crisp and clean, with no hiss or distortion. Excellent all the way around. An English language stereo track is also included—adequate but much less substantive—along with a 2.0 Spanish language dub. Extras Review: Extras include a commentary track from Garrett Scott, Ian Olds, sound designer Jim Dawson, and Dreamland soldier Joseph Wood. It's a little dry, but Scott and Olds talk up how they extended what was pitched as a "day in the life" when they arrived in Falluja. Soldier Update (02m:06s) offers a few text-based screens with "whatever happened to" info on the soldiers featured in the film. Marine Assault Footage (05m:42s) contains some fairly tense fighting, and there's also a set of four brief deleted scenes (09m:12s), including additional raid footage. Lastly, there's a theatrical trailer, and a foldout booklet gives some insight into Falluja, as well as a timeline of events. The disc is cut into 14 chapters, with optional Spanish subtitles. At one point, during one of the U.S. patrols, an angry Iraqi citizen gives the ominous warning: "This is Falluja. Be careful of Falluja." True words. This fly-on-the-wall look at the lives of a squad of U.S. soldiers following orders and struggling with ever-increasing waves of violent hatred toward them during the "occupation" is eye-opening, frightening, and frustrating. Nice presentation, and an impressive 5.1 audio mix is the capper.